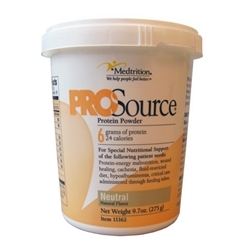 ProSource Protein Powder is specifically formulated to provide the nutrients for the dietary management of protein malnutrition through a feeding tube. ProSource Protein Powder is manufactured so that it will mix in liquids without lumping, reducing the risk of clogged feeding tubes. One 7.5-g serving (one scoop or packet) contains 6 grams of high-quality protein and only 30 calories. Oral: Add one or more scoops or packets to any cold or hot liquid, moist food, soup, shake, or smoothie. Tube: Mix one scoop (7.5 grams) or one packet with 60 mL water. Stir until completely dissolved. Infuse via syringe down feeding tube. Flush tube with 30–60 mL water before and after administration. Can be mixed with enteral formula. 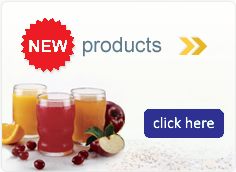 Ingredients: Whey protein concentrate, calcium caseinate, natural and artificial vanilla flavors, soy lecithin. Contains milk (3% lactose), soy.